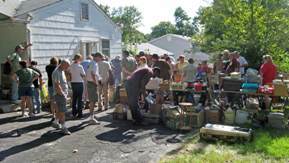 > Estate Sale - Tag Sell It or Household Auction - What's the difference? Estate Sale - Tag Sell It or Household Auction - What's the difference? St. Louis based Father Time® Auctions answers; Who can provide liquidation services for my family's estate? Should I have an Auction or an Estate Tag Sale? If you want to liquidate the assets of your family's estate the best and most economic method is to have a public auction. Auctions generate competition between buyers garnering the highest fair market value for the items. Tag sales do not accomplish this nor do estate buyouts. A specific day is set for the auction and everything will sell that day with a group of buyers COMPETING for every item up for bid. For an estate with quality antiques and collectibles, a public auction beats all other forms of liquidation. 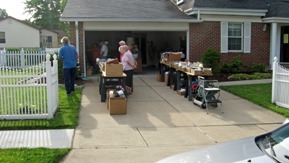 Conversely, for household items and yard sale merchandise, an auction is less of an option, although can be very effective to sell lots of goods in a liquidation clean out. Someone will establish a price for each item and open the property to buyers. There is a lot of time, effort and expense involved with pricing everything and once the sale begins customers ask and demand "will you take" competing the buyer vs. the seller. As the sale progresses the buyers know that the seller's sale position weakens each hour as the purpose of the estate sale is to sell and get rid of the stuff. If the company conducting the tag sale does not negotiate a price once it has been set everything will not sell. An estate buyout is typically only beneficial to the individual doing the buyout. You will not obtain the highest return as they are almost always re-salers and are only looking to make a profit for themselves while providing the estate with a minimal value for the items. almost everything sells, even your nuts, bolts, screws, plastic, etc. What you may have lost on a piece of furniture, you'll make up with the money you receive from the junk! You'll have the satisfaction of knowing the public bid on your items FAIRLY and no employee had a chance to buy it first and stash it in a closet! If you are the Administrator of the Estate, it’s your responsibility to obtain the most for the estate in a fair and reasonable manor. Accountability to other family members and the courts should require a detailed inventory and accounting of what’s sold and who purchased it. 2. Would you rather have ONE person, usually the tag sale manager, price your possessions, or would you rather have a fifty people bidding up the price and giving you the truly Fair Market Value of your items at Auction?